The fourth book in the beloved Poppy series by Newbery Medal–winning author Avi, with illustrations from Caldecott Medal–winning artist Brian Floca. Erethizon Dorsatum—better known as Ereth, the self-centered, foul-tempered old porcupine—is having a birthday. And he fully expects his best friend Poppy, a deer mouse, to help him celebrate in a grand manner. Ereth knows his special occasion deserves a special treat—even if he has to get it for himself. And what treat could be more special than tasty salt? But the nearest salt is located deep in the forest, in a cabin occupied by fur hunters, who have set out traps to capture the Dimwood Forest animals. In one of the traps, Ereth finds Leaper the Fox—who, with her dying breath, begs the prickly porcupine to take care of her three boisterous young kits, Tumble, Nimble, and Flip. "Jellied walrus warts!" Ereth exclaims, but reluctantly agrees. Certainly this day is not going as he planned—and it's only just the beginning! Not only does Ereth suddenly have a rambunctious new family to take care of, but he's being stalked by Marty the Fisher, the one creature in Dimwood Forest who can do him harm. And Bounder, the father of the three little foxes, remembers all too well the nose full of quills he got a while back from the grumpy old animal who now fancies himself the leader of the den. He too sets out to show Ereth who's boss. 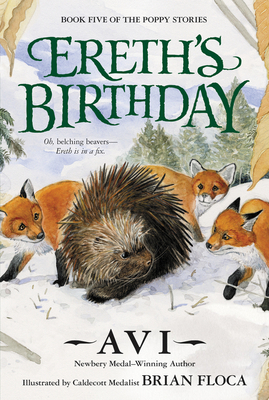 Throw in an unexpected snowstorm, and all in all, it adds up to one birthday Ereth the porcupine is never going to forget, not even if he lives to be a hundred and twenty-two! Brian Floca's illustrations have appeared in several books by Avi, including the six volumes of the Poppy stories and the graphic novel City of Light, City of Dark. For younger readers, he is the author and illustrator of Moonshot: The Flight of Apollo II as well as the highly praised books Lightship, a Robert F. Sibert Honor Book and ALA Notable Book; The Racecar Alphabet, also an ALA Notable Book; and Five Trucks.